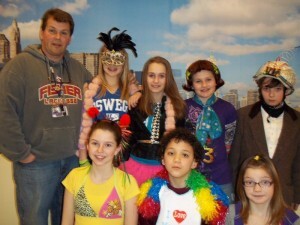 OSWEGO, NY – Fitzhugh Park School held “Freaky Friday” as a culmination to its annual March Madness month. The day was designed to have the school show support for the Red Cross Japan Disaster Relief Fund. Schools throughout the Oswego City School District held similar events to raise money for the same cause. The Fitzhugh Park students and staff raised more than $225 by being allowed to dress up in their “freakiest” outfits. Displaying their creations are (front left to right) Leah Taylor, Adrian Colvin and Breeann Smith. In back are FPS Student Council advisor Ed Fayette, Elaina Broadwell, Mikayla Trapasso, Allie Rogers and Chris Colasurdo.